Our road cycling holidays in Italy have never been more popular and Sardinian Mountains is proving to be a great road cycling alternative to our ever popular Sardinia Coastal Explorer holiday. The island of Sardinia is a beautiful Mediterranean gem famous worldwide for its sea and its coasts, yet more than 80% of its territory is mountainous and hilly, with many peaks well over 1,000 metres high. The smooth surfaces of the mountain roads are perfect for cycling and are virtually traffic-free too. Surrounded by forests and beautiful countryside, it is a wild environment without busy towns or cities. During your time on the bike you'll explore the very heart of Sardinia with its well preserved ancient traditions, including those in the kitchen as well as the small and friendly mountain villages. This friendly Italian island has everything you need for a memorable road cycling holiday - great roads, superb scenery, and fine food. Sardinia is a paradise for cyclists and we’re sure this tour will leave you with a desire to return and explore some more. 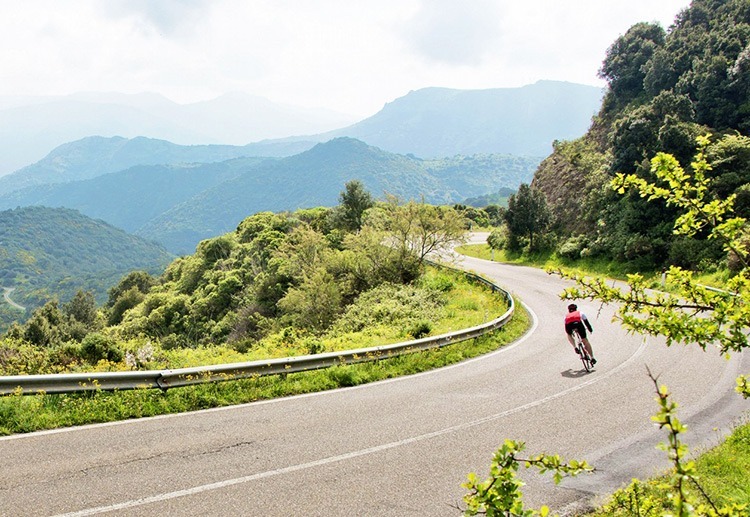 The Sardinian Mountains road tour is a step up in intensity from our Sardinia Coastal Explorer holiday and the trip is suited to riders who prefer a few more miles under their belt each day.